The author at Samuel Kirk's grave. After using genetic genealogy to identify my paternal great-grandfather, I was eager to pay my respects at his grave. 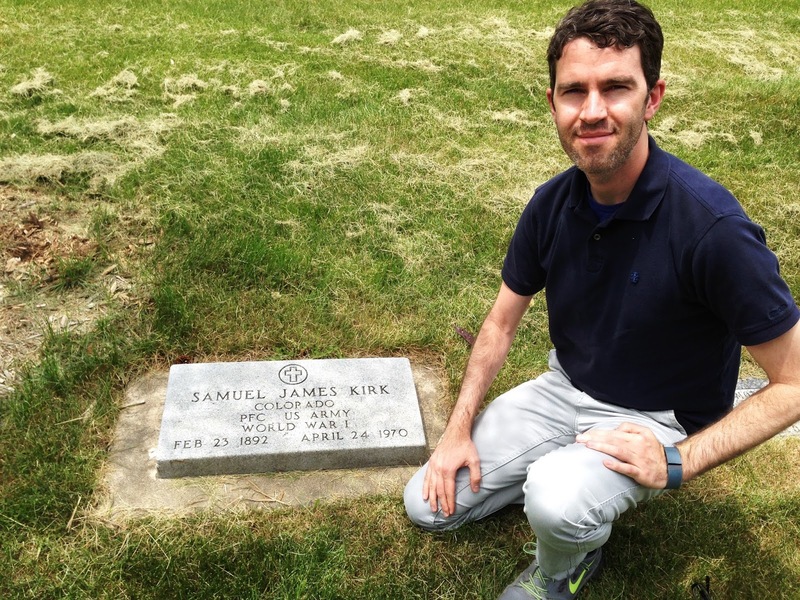 Samuel James Kirk is buried in the foothills of Golden, Colorado in the shadows of looming peaks. 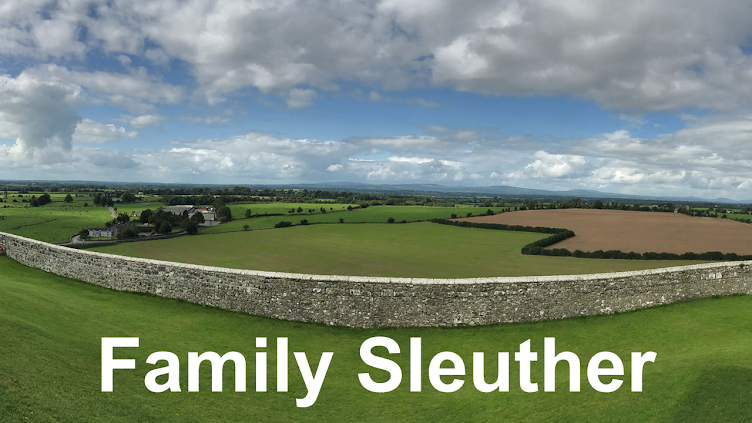 While I had gone through great research pains to discover his identity and confirm his genetic link to my family, his grave taught me even more about his history. His headstone was inscribed: PFC US ARMY, World War I. This was the first confirmation I had that he actually served in the military. 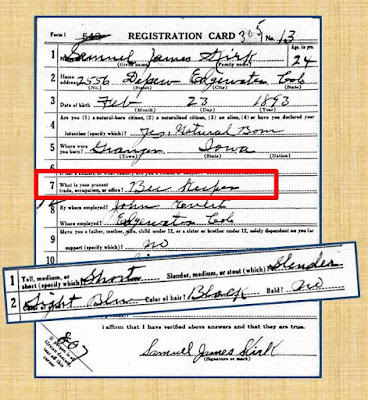 To learn more about his service, I went back to his 1917 WWI draft registration card. At 24 years old, he was single with no dependents, and described as short and slender with light blue eyes and black hair. Coolest of all, he worked as a beekeeper. Yes, my great-grandfather was an apiarist! 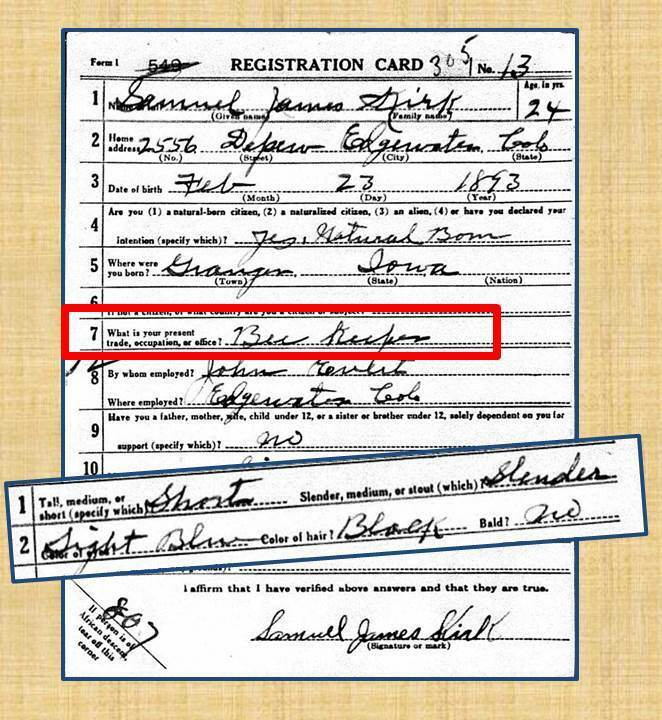 These are the kinds of details not always apparent on the census (in 1930, for example, his occupation was enumerated as odd jobs. Oh, come on, tell me more! How odd?). 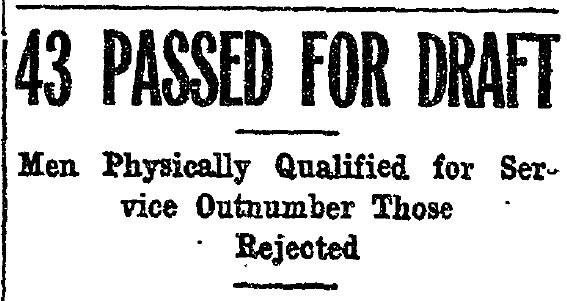 On Valentine's Day 1918, the Colorado Transcript published a list of 43 men who were examined by a doctor and found to be physically fit for military service. Among them was Samuel J. Kirk. I was unable to determine exactly when he was drafted into service, but I assume it happened shortly thereafter. Of course, the 1973 fire that raged through a St. Louis National Archives repository and destroyed an estimated 16 to 18 million military personnel records didn't help matters. My inquiries for information from the National Archives were met with requests for me to help them re-establish their file for Sam's service. It was a catch-22. Perhaps there were local records in Colorado that could shed more light on his service. I wrote to the Denver Public Library to see what information their Western History/Genealogy division may have on Samuel Kirk's service. An archivist with the library discovered another small but helpful clue. A published volume, Roster of Men and Women Who Served in The World War From Colorado 1917-1918, reiterated that his rank was Private First Class (PFC), but added that his branch was the Motor Transport Corps (MTC). That was new information! In its earliest existential conflicts, the United States depended on soldiers on foot, horses and later trains to transport men and cargo. During the First World War, military transit quickly evolved and the Army relied heavily on emerging 20th century technology including motor vehicles. At the War's end on November 11, 1918, the MTC "numbered 1,135 officers and 26,957 enlisted men. "3 Samuel Kirk was among those enlisted men, but where did he serve? An answer eluded me. On Memorial Day, I received a wonderful gift from a Kirk cousin: a collection of original photographs of Samuel Kirk that were nearly 100 years old. Until this point, I had only seen a couple grainy images of him and owned no originals. The prize among the photos was a fantastic portrait of Samuel in his MTC military uniform. There were also three tiny photos about an inch in height that were difficult to make out. Each had Sam's name penciled on the back. There was no other identifying information about the location or about the other men pictured. Samuel Kirk in MTC uniform pictured left. Samuel Kirk pictured right with perhaps an MTC officer. His studio portrait was embossed with the photographer's name and location: the Presidio in San Francisco. According to the National Parks Service, the Presidio was a "preeminent military post under the U.S. Army." Was Sam stationed stateside during his enlistment? I was able to further confirm his location by zeroing in on the curious backdrop in the last photo. A Google search found a matching San Francisco domed monument. The photo appeared to be taken in front of the Palace of Fine Arts, which was constructed in 1915 for the Panama-Pacific Exposition. The monument was less than a mile from the Presidio. Collectively, the photographs provided my research a location to focus on Sam's WWI service. What was the MTC doing in San Francisco? Did Sam know of Eisenhower's role in the MTC convoy? Would he recall their service in the 1940s when Ike was the commanding general overseeing D-Day operations and in the 1950s when he was President of the United States? An interesting side-thought to ponder. Given the early 1918 medical clearance Samuel received for the draft, I speculate that he was already pulled into wartime service with the MTC long before the convoy set out. I haven't been able to confirm whether he played a role in the convoy. The MTC lured young men into service with the promise of equipping them with the skills that would make them marketable following their service. Wartime recruitment posters boasted that men who enlisted with the MTC would learn to be mechanics. I can only imagine the exciting appeal of learning to work on the newfangled automobile. While Samuel Kirk, to my knowledge, never met his son - my grandfather - I find it an interesting quirk of fate that both my grandfather and father (who also didn't have much of a relationship) would become mechanics. The profession - from the beginnings of the auto industry to the modern day - would link three generations together who otherwise had almost no interaction with each other. Perhaps I have the Motor Transport Corps to thank for that. And to think that I was inspired and able to learn all of this - despite the disastrous military records loss - from a visit of homage to Samuel Kirk's grave. 1 Killblane, Richard. "70 Years of the Transportation Corps." United States Transportation Corps. 19 June 2014. 2 "Manual of the Motor Transport Corps." American Expeditionary Forces. June 1918. 3 "Order of Battle of the United States Land Forces in the World War." Center of Military History United States Army. Washington, DC, 1988. 4 Scheck, William. "World War I: American Expeditionary Forces Get Motorized Transportation." Military History Magazine. June 1997. 5 "The 1919 Transcontinental Motor Convoy." Dwight D. Eisenhower Presidential Library, Museum and Boyhood Home. 6 Preston, Benjamin. "How An Army Convoy Crossed America in 56 Days to Prove We Needed Better Roads." Jalopnik. 18 February 2013. 7 "1919 Motor Transport Corps Convoy." Wikipedia. I love this story, especially since you were able to work around the 1970s loss of records in that fire. Thank you, Linda. It just goes to show you that burned records don't always mean the research trail has been snuffed out. Great post. My husband's great-grandfather was in the MTC in WWI. I appreciate you fleshing out more of what that was all about. And I love the recruitment poster. Thanks for sharing. Keep up the good work. Thank you, Mary. It was a fascinating jaunt into history, learning about the role the MTC played in America's deep love for the automobile (not to mention my own family's subsequent connection with the mechanics profession). That poster set my paternal line on a professional path, for sure! I appreciate the comment! Enjoyed the post and your ability to track down records that tell the "rest of the story". Also one of my favorite things about family history! I agree! History really comes to life and takes on greater meaning when we see how it impacted our ancestors.